Our Cue Repair Kit has everything you need to repair your tips properly. 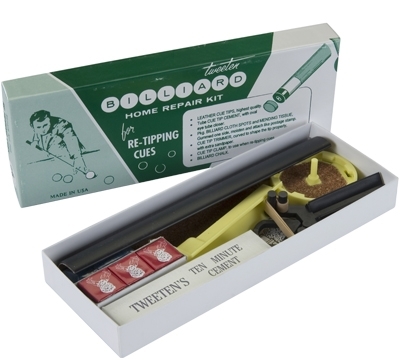 Included in this kit are leather cue tips, a plastic topper, glue, tip shaper and cue clamp. It also has a cloth mender, spots and extra pieces of chalk. Manufactured in U.S.A.